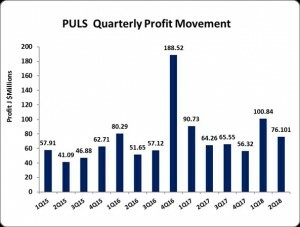 Pulse Investments Limited, for the six months ended December 31, 2017, reported revenue increased 15%, closing at $216.79 million, from $188.49 million in 2016, while for the quarter, revenue amounted to $97.41 million up by 21% compared to the $80.39 million booked in 2016. Administrative and Other Expenses went up by 15% to $97.65 million (2016: $84.64 million) for the six months period. For the second quarter there was an increase of $11.29 million or 28%, closing the period at $51.38 million relative to 2016’s $40.09 million. As such, Operating Profit increased 15%, closing the year at $119.14 million compared to the $103.86 million posted in 2016. Profit before finance costs amounted to $178.41 million, an increase of 14% relative to the $156.64 million recorded last year. Finance Cost for the six months decreased by 11% year over year, to close at $1.47 million (2016: $1.65 million). Net Profit attributable to members increased by 14%, closing the year at $176.94 million, from $154.99 million for the corresponding period in 2016, while for the quarter Net Profit totaled $76.10 million relative to $64.26 million reported in 2016. Earnings per share (EPS) amounted to $0.11 for the six months relative to $0.10 in 2016. The EPS for the quarter totaled $0.04 versus $0.03 booked for the comparable quarter of 2016. The trailing twelve months earnings per share was $0.18. The number of shares used in the calculations is 1,630,738,044 units. PULS stock price closed the trading period in February 19, 2018 at $1.80. Total Comprehensive Income for the first six months ended December 31, 2017 amounted to $181.89 million relative to the $159.93 million booked in 2016, a 14% increase year over year. Assets totaled $2.66 billion, an increase of 17% relative to the $2.28 billion booked the year prior. This movement was driven by an increase in Investment Property totaling $1.57 billion (2016: $1.39 billion) and Advertising Entitlements Receivables amounting to $635.24 million (2016: $492.19 million). Shareholder’s Equity as at December 31, 2017 stood at $2.47 billion (2016: $2.16 billion) resulting in book value per share of $1.51 (2016: $1.32).